On 8 July 1947 the fleet consisting of four ships left Lisbon. It carried with it a four-vessel fleet consisting of two-medium sized sailing ships, a *caravel and a large storeship. Knowing that the currents along the African coast would impede his progress,I boldly set a course that took me far from land, sailing in uncharted waters. The explorers rounded the southern tip of Africa, which they named the "Cape of Good Hope", on November 22. At this point they no longer needed the storeship, so it was broken up and burned. they continued sailing up the Eastern African coast but stopped as many crew members were sick with *scurvy. The expedition rested a month for the crew members to heal and for the ships to be repaired. On March 2 the fleet reached the island of Mozambique. Being treated friendly, I learned that the natives traded with Arab merchants and the Sultan of Mozambique supplied me with a pilot to guide them. We soon reached Calicut in less than a month. We were in the most important trading center in Southern India at that time and were welcomed by the Hindu ruler, Zamorin. However, I was unable to make a trade agreement with him due to certain circumstances. as tensions mounted, I left for Malindi in late August. As the pilot had abandoned us in Calicut, we travelled back on their own. The weather was not good and the crew was not prepared for a return journey that would last three times as long. Once again, most of the crew members contracted scurvy and many died while others were nearing death upon reaching Malindi. Thankfully, the Sultan there was of extreme help and supported us in many ways. 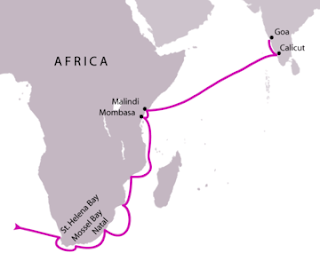 The remaining ships set out for home and skirted the Cape of Good Hope on March 20. they reached Portugal on July 10. My ship continued on the Azores, and I reached my original starting point, Lisbon on September 9. While hailed as a hero as the acheivement was remarkable (for I had travelled 27, 000 miles) by sea, the trip had taken a great toll. I returned with only half of his ships and less than half of his men. One casualty was especially hard on me: I lost my brother Paulo Da Gama to sickness on the last leg of the journey. Although I had returned with a small amount of tradable goods, I brought back a much more valuable commodity, a sea route to India. The door was open and the Portuguese intended to use it to its fullest.